In Defense of Joseph: Who was the greatest defender of Joseph Smith, Jr.? 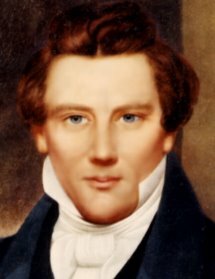 Who was the greatest defender of Joseph Smith, Jr.? Many blogs, discussion groups, and even Wikipedia assert that toward the end of Joseph Smith III's life he wavered in his belief that his father, Joseph Smith, Jr., did not teach or practice polygamy. According to a Wikipedia article on the origin of LDS polygamy, "In the end, Smith concluded that he was 'not positive nor sure that [his father] was innocent' and that if, indeed, the elder Smith had been involved, it was still a false practice." This position is used by those believing Joseph Smith, Jr. taught and practiced polygamy to diminish Joseph III's lifelong defence of his father's honor so their position can be made stronger. However, this position is just not true. Just a little over a year prior to his death, Joseph Smith III still believed his father "to be innocent of responsibility for the evils [polygamy] they [Utah LDS] had embraced." Thus, contrary to what many proclaim, he did not waiver in this position. He was firm in his belief to the end. Through all of his investigations, Joseph III never found a shred of credible evidence, even from the alleged plural wives, to prove his father guilty of polygamy. Thus, he remained convinced of his father's innocence to the end of his life. Indeed, Joseph Smith III was his father's greatest defender. Great work! I have some books dealing with the polygamy issue. I look forward to more material and perhaps a study on each woman who is claimed to be a plural wife to Joseph. I too am RLDS Restorationist and believe Joseph innocent of polygamy. She began work in May 1880 on the 'Woman's Exponent', which dealt some with polygamy. In 1881, Helen wrote to her children that the 'sealing' to Joseph was "for eternity alone"
In 1882, Helen wrote 52-pg pamphlet 'Plural Marriage as taught by the Prophet' in response to Joseph Smith, III. In 1884, Helen wrote 72-pg. pamphlet 'Why We Practice Plural Marriage' & also BEGAN her diary/journal of her life on Nov. 12, 1884. Thanks for the encouragement. The authors of Joseph Smith Fought Polygamy intend to address allegations of alleged plural wives in future writings. I also hope to include in this blog evidence refuting several of their allegations. It is important that this information is made known so others will understand about Joseph’s innocence. If you have such information from your studies, I would appreciate knowing your sources.